The Renaissance does not have a start date. Its origins are often located around 1400 but as early as the late 1200s we see changes in painting and sculpture that lay the foundation for what we will come to recognize as the Renaissance. Some scholars call this early period the “Late Gothic”—a term which refers to the late Middle Ages, while other people call it the “Proto-Renaissance”—the beginnings of the Renaissance. In any case, a revolution is beginning to take place in Italy the early 1300s in the way people think about the world, the way they think about the past, and the way they think about themselves and their relationship with God. The artist who takes the biggest step away from the Medieval style of spiritual representation in painting in the early 14th century is Giotto. 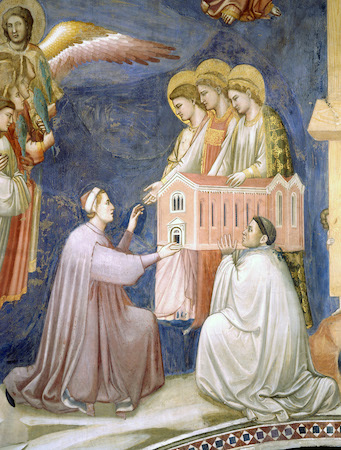 Giotto is perhaps best known for the frescoes he painted in the Arena (or Scrovegni) Chapel. They were commissioned by a wealthy man named Enrico Scrovegni, the son of a well-known banker (and a banker himself). 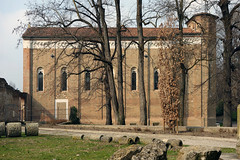 According to the Church, usury (charging interest for a loan) was a sin, and so perhaps one of Enrico’s motivations for building the chapel and having it decorated by Giotto was to atone for the sin of usury. 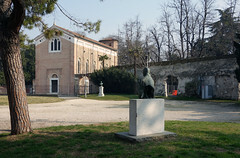 The chapel is known as the Arena Chapel since it is on the site of an ancient Roman arena (or amphitheater) that later became the property of Scrovegni, whose palace abutted the chapel (the palace was torn down in the nineteenth century, though parts of the arena remain). The photo at the top of the page gives us a sense of what it feels like to be a tourist visiting the Arena Chapel. 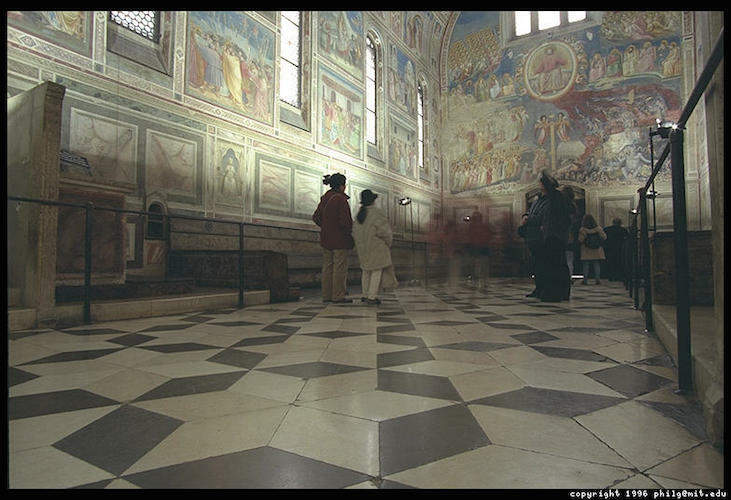 Because frescoes are painted directly on the wall, they can’t easily be moved and put in a museum. Most frescoes are therefore still in the spaces that the artists created them in and that the patrons commissioned them for. Having the work of art in its original context helps us to understand its meaning for the people of the 14th century. 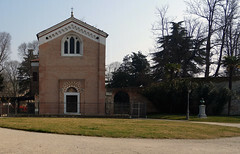 Looking at the photo, you can see that there are numerous separate images in the chapel. The frescoes tell the story of the lives of Mary (beginning with her parents, Joachim and Anna) and Christ on the long walls. By the altar, Giotto painted the Annunciation, and at the other end, on the entrance wall, the Last Judgment. Rather like a comic book without words, Giotto tells the story of Christ and his parents through pictures. Most of the population of Europe was illiterate at this time and so couldn’t read the bible for themselves (Bibles were rare and expensive in any case—there was no printing press and so each was copied by hand). People learned the stories of the Bible—stories that would help them get to heaven—by hearing the words of the priest in the church, and by looking at paintings and sculptures. ¹In one interpretation, the nearest figure is the Annunciate Virgin, the middle figure Saint Mary of Charity (so the two important roles Mary plays in the chapel), and the last figure is the Angel Gabriel. Another source identifies these additional figures as St. John the Evangelist and Mary Magdalene. These figures have also been identified as the Virgin Mary, the Virgin of Charity and the Virgin Annunciate. Cite this page as: Dr. Beth Harris and Dr. Steven Zucker, "Giotto, Arena (Scrovegni) Chapel," in Smarthistory, December 30, 2015, accessed April 23, 2019, https://smarthistory.org/giotto-arena-scrovegni-chapel/.